Feeling worried about no roaming data when you're traveling to Macau? you can enjoy free roaming data offer in Macau provided by 3HK. 3HK customers and all other HK operators' customers can enjoy the offer! Promotion period: From now until 31 Mar, 2018. Promo codes can only be used for Macau hotel bookings (prepaid rooms) exceeding HKD1,200, and are only valid when paying in HKD. 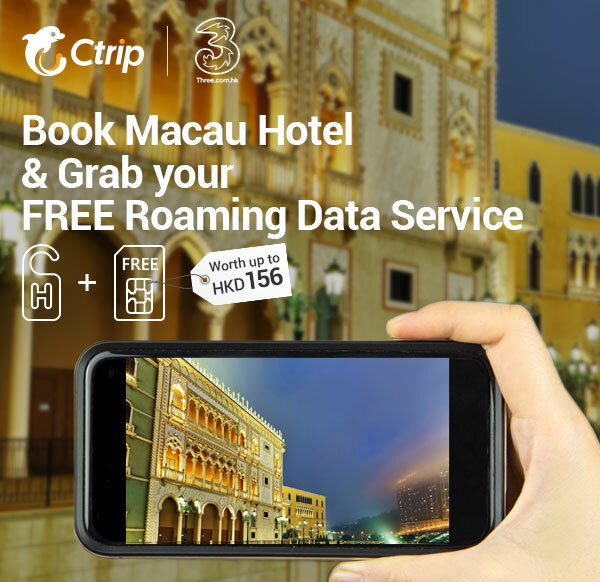 Promo code usage: Enter the code on the hotel booking page, you will be receiving an email with free Macau roaming data redeption details after hotel booking confirmed. Only one promo code can be applied to each booking. Customers need to click the attached URL from the offer confirmation email, then register with a valid Hong Kong Mobile number before 31 Mar, 2018. Late redemption will not be entertained. 3HK Monthly Subscribers can enjoy two days complimentary "3RoamLitePass" (Valued HKD156) in Macau. Customer can use 500MB per day and the maximum speed is 128Kbps afterwards. Customer will get 3HK "Hong Kong & Macau 5-Day Pass Prepaid SIM" in case customer cannot register to 3RoamLite Pass. Non 3HK Monthly Subscribers can redeem 3HK "Hong Kong & Macau 5-Day Pass Prepaid SIM" having 1GB data worth HKD98. Customer will receive an SMS for promotion confirmation within 2 hours upon subscription. This offer is only applicable to selected 3HK monthly subscribers ("Customers") and using 3RoamLite Pass (collectively the "3RoamLite"). "3HK monthly subscribers promotion": Customer can enjoy two days complimentary "3RoamLitePass" (Original price at $78) in China or Macau within Promotional Period. Thereafter, usage in designated destinations and networks will be charged on 3RoamLite basis ($78/88 per day). For service details of 3RoamLite, please click 3RoamLite Pass. This promotion is valid from now (00:00 HK time) to 30 Apr, 2018 (23:59 HK time) ("Promotional period"). 3RoamLite charges will apply when roaming data usage occur apart from the promotional period. This promotion is only applicable to designated 3HK customers' mobile only and cannot be transferred or resold. Full roaming service will be activated upon activation of 3RoamLite Pass to facilitate usage of data roaming service. Please click here for details of full roaming service. Daily charge starts to incur upon successful activation and usage of 3RoamLite, and is chargeable on a daily basis and will not be pro-rated even if the 3RoamLite is activated and terminated within the same day. Daily service charge means charges incurred under the 3RoamLite each day from 00:00 to 23:59 (Hong Kong time) regardless of the physical location of a customer. 3RoamLite will remain effective despite expiration of Promotion period (30 Apr, 2018), 3RoamLite charges will apply if Customers continue to use data and other roaming services. For service details of 3RoamLite, please click 3RoamLite Pass . The offer cannot be used in conjunction with other offers. 3HK reserves the right to vary, modify or terminate the contents of this promotion, as well as to amend any of the relevant terms and conditions from time to time without prior notice. HTCL's decision and record shall be final in case of any dispute. Non-3HK Monthly Subscribers offer details: Non-3HK monthly subscribers will receive Confirmation SMS and need to redeem the Prepaid SIM at selected location before 7 Apr, 2018. To activate the SIM and subscribe the "Hong Kong & Macau Package": please insert the SIM into your mobile and press ##107*0# to activate the SIM, then press *127*313# after receiving the card activation confirmation SMS. The Pass will be ended on the 5th day 23:59 (Hong Kong time) automatically after pass subscription. To check the SIM stored-value and account details, please press ##107# via your mobile device. For recharge method, SIM card details and other terms and conditions, please click here. Hotel cancellation and prepayment policies may vary according to room type. Please refer to the room policies upon reservation. Prices are correct at time of publication and are subject to availability and change. Please see ctrip.com.hk to confirm availability, prices and applicable terms and conditions. In the case of booking cancellations, the promo code used for that booking will automatically be returned to your account and made available for use during the promotion phase it was issued in. Promo codes used for hotel bookings which are then modified by the customer service hotline will be considered null and void. Ctrip.com International Ltd. (CTRP) and 3HK reserves all rights of final interpretation.